We are almost near the end of the week and i must say things are looking good for the trend traders eh? 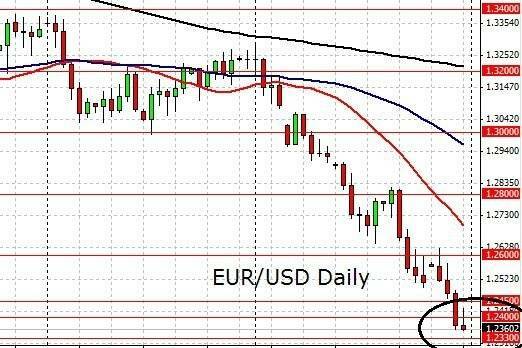 In previous EUR/USD forecast reviews, we noted the main themes of Euro Zone political instability and global economic show down. Risk aversion is swamping the markets. 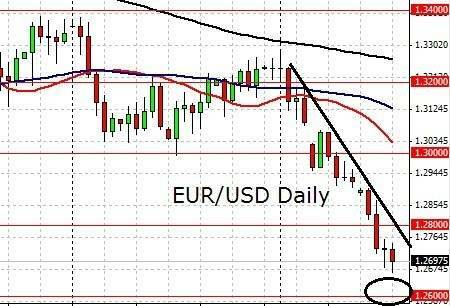 Looking at the EUR/USD chart above, we note a very bearish EUR/USD. Both the SMAs are bearish and any attempts to find a bottom now may be very risky. While many readers told me how happy they are with their harvests of pips, an equal number of readers unfortunately had margin calls trying to bet a bottom. Dear readers money is hard to come by. Always trade safely! Continued bearish momentum will have us testing and going beyond the previous low at the start of the year to land right at 1.26. The European Central Bank has announced that it will stop lending to a number of Greek banks in a bid to limit it’s risk exposure. This is a signal that the ECB will not compromise on key principles to keep Greece in the Euro Zone. Many economists and investors predict of a financial storm should Greece leave the Euro Zone as this also means a probable bankruptcy of Greece. Should that happen, the turmoil will be far reaching as many worldwide are invested with Greek debt. Besides Greece, Spain is also struggling with increasing interest demanded to hold it’s bonds. This presents a challenge for financing operations. On the other hand, the US continues to post rosy economic data. The US Federal Reserve was reported to be apparently willing to further stimulate the economy via easing operations otherwise known as quantitative easing. This is generally favored by the markets. Leverage on the market. Get insights on the sentiments of forex traders based on their Long : Short ratio of open positions.